After years of resisting the voice that has called him since childhood, Nigerian-born Father Michael Odinaka Ugbor, 37, finally surrendered to God in a diocese 5,000 miles from home. “And now, finally, I am here,” he said, laughing. A native of Enugu State in eastern Nigeria, he is the fifth of six sons born to Christiana and the late Michael Ugbor Sr. of St. Cyril Church, Egede. He was raised in a home where God and faith were taken seriously. His father had converted to Catholicism just before he was born. “My dad was really so prayerful,” Father Ugbor said. From a young age, Father Ugbor learned to be serious with important things, and dedicated himself to both his faith and his studies. 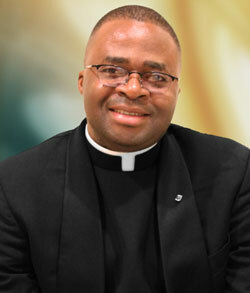 He attended primary grades at Central School Egede, Enugu, and high school at St. John Cross Seminary. Nsukka. He graduated from SS. Peter and Paul Major Seminary, Ibadan, with a bachelor’s degree in philosophy in affiliation with the University of Ibadan, Oyo State. He also earned a diploma in Latin from the Pontificia Università Urbaniana, Rome. It was toward the end of his elementary school years that he had his first thoughts of priesthood. “I began to have this feeling, to hear this voice, ‘What can I do for God?’” he said. That voice persisted in the back of his mind, waxing and waning through his early years of seminary formation. When he completed his studies in philosophy, he decided then that priesthood was not for him. He left the seminary and became a teacher. Rethinking his future, he opted for a career in education and school leadership. He moved to Jamaica, Queens, in 2013, and began doctoral studies at St. John’s University. He found Presentation of the Blessed Virgin Mary parish nearby and came to know Father Manuel de Jesus Rodriguez, pastor. At the university, his professors and classmates often mistook him for a priest, he said, and the voice that his mind tried to mute for so long “became so intense again” that he could ignore it no longer. He contacted Father Kevin Abels, then-diocesan vocation director, and was accepted into formation for the Brooklyn Diocese. With a change in major, he continued studying at St. John’s University, and then attended St. Joseph Seminary in Dunwoodie, where he earned master’s degrees in theology and divinity, and a bachelor of sacred theology degree. His pastoral preparation included summer assignments at Our Lady of Refuge Church, Flatbush, and Blessed Virgin Mary Help of Christians Church, Woodside, where he also spent his diaconate year. These experiences in parish life enabled him to engage in various works of mercy: visiting the sick, feeding the hungry, comforting the bereaved and counseling young people in the faith. Father Ugbor is fluent English and Ibgo, and is trying to learn Spanish so that he can better serve the faithful in Brooklyn and Queens. In his ministry, he hopes to be “a priest that transmits mercy,” especially through the sacraments. Father Ugbor will celebrate his First Mass of thanksgiving at Presentation of the Blessed Virgin Mary Church on Sunday, June 4 at 9 a.m. Father Michael Perry, pastor of Our Lady of Refuge, will preach the homily.